Small Christmas trees make great Christmas gifts for anyone. I customize all my trees for the person I give them to, using decorations and colors especially for them. 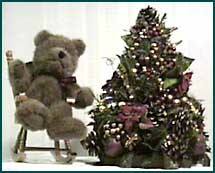 The instructions below are for 11-12" trees with battery operated lights. You can make a small artificial christmas tree without lights just as easily (actually, more easily). All the materials should be available at your local craft store. Cut a rectangular hole in the circular base so that the battery pack fits snugly, and the battery slider panel is still accessible. If you cut the hole too large, your battery pack tends to fall out. Your best bet is to try to cut the hole a little smaller than the pack, and then squeeze/push the pack into the opening. The styrofoam will "give" a little, and the pack will fit snugly. Secure the cone to the center of the base using a combination of hot glue and stick pins. Don't worry if the pins stick up a little bit. By the time you get all your decorations on, they won't be visible. Spray paint the cone and base. Painting the tree shape means you don't have to worry about completely covering the styrofoam with decorations. If a little gold or silver shows through it'll still look great. Be sure to do this in a well ventilated area and let dry overnight. Now, decorate the tree. Start with the largest decorations. If you'll be using greenery, secure the leaves/branches first. Large silk fs can be separated and stuck into the styrofoam. For decorations without stems, attach a short piece of wire to the decoration first, then poke it into the styrofoam, and use hot glue and stick pins to secure. Fill in gaps with smaller decorations until you have the "look" you want. I found a wide variety of items at my local craft store and in catalogs to use in making my "customized" trees. For instance, I wanted a music "motif" for my aunt the music teacher, and I found a wide variety of small instruments which I placed around my tree. Some of the decorations I used had originally been intended for a flat surface and were difficult to attach. For those, I used hot glue to attach them first to a small piece of wire or stickpin, which I could then insert into the styrofoam. Many of the decorations, however, were easily secured just using my glue gun. Shop for decorations after Christmas. You can usually find all kinds of Christmas decorations at your local craft store for very little money, since they're all on sale. Silk Christmas florals can be cut apart and used for all kinds of crafts!